Use our tips for successful onion storage of your home-grown onions! 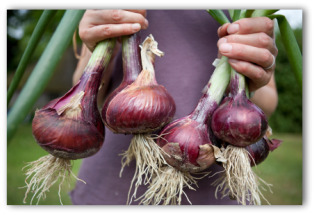 Learn how best to harvest and store onions from your vegetable garden for winter use. The best place to store your onions is in a cool, moist area inside baskets or braided. 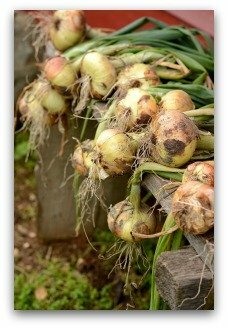 Onions are reliable root cellar storage. Storage onions such as Copra and Prince keep well for months if harvested and stored properly. 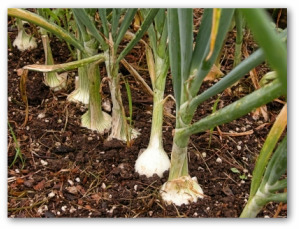 Use storage onions grown from sets initially because they will keep better than ones developed from seeds or transplants. Onions are separated into two kinds, which are short day and long day. Short day varieties need about equal amounts of light and darkness to set bulbs. These grow best in southern regions. An example of a short day variety is Yellow Granex or Vidalia. Long day types require around 10 hours of darkness and 14 hours of light. These varieties do better growing in the North. 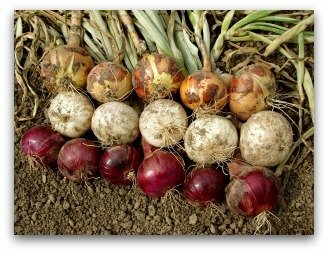 Examples of long day onions are Baby Borettana and First Edition. 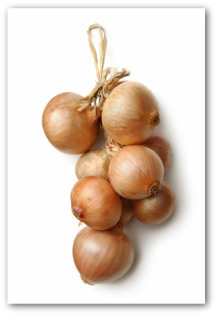 Speaking of First Edition, it is one of the top picks in the best onion varieties. It is rich flavored, has long storage, and full sized bulbs. Give your onions a sunbath before putting them into storage after harvesting. Try to wait until a dry, sunny, warm spell to harvest so the bulbs can cure in the sun for at least a week prior to storing. This will give the outer onion skin a chance to dry to a papery consistency. If it rains, move the bulbs to an open porch or airy garden shed that is covered. To maintain a cool temperature for your onions, be certain there is an exhaust vent or window to the outside for allowing cold air in as needed and provide air circulation. The window should be blacked out to make the room as dark as possible. Shelving should stand about three inches away from the walls to maintain proper air exchange. Storing tomatoes and/or apples, which emit ethylene gas, near onions causes the onions to sprout. 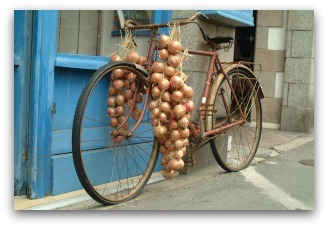 A decorative and practical way to store your onions is to braid the tops together after they dry. The braided onions can be hung for storage in a cool dry location. For the storage crops that prefer it damp and cold, you are not likely to find the proper conditions unless you have an unheated basement or root cellar. Even with the required condition, you may want to partition off a specific location especially for food storage. A root cellar is ideal for most onion storage needs as well carrots, beets, and other root vegetables. The term root cellar often brings up images of an immense place underground. Although, it does not have to be a huge size as long as it is cool and moist. Around 38 degrees is the perfect temperature for onion storage. A common method for constructing a root cellar in the past included to dig down into the ground and erect a house or shed on top of the cellar which was accessed through a trap door inside the shed. Other techniques were digging into the side of a hill or building a structure at ground level and piling earth and rocks around and on top of the root cellar. Most were built using wood, stone, sod, and cement. Newer ones may be constructed of concrete with turf on top. To build a root cellar in a heated basement, the surface you choose has to be insulated and isolated. If you need to keep the cellar humid, use concrete blocks with foam insulation on the outside. If you would rather use wood with fiberglass insulation, simply add the moisture to the storage containers.